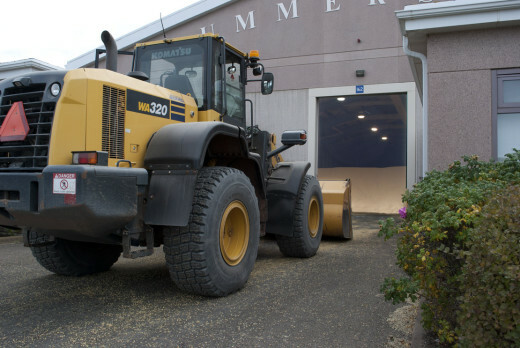 News | Summerside Port Corporation Inc. 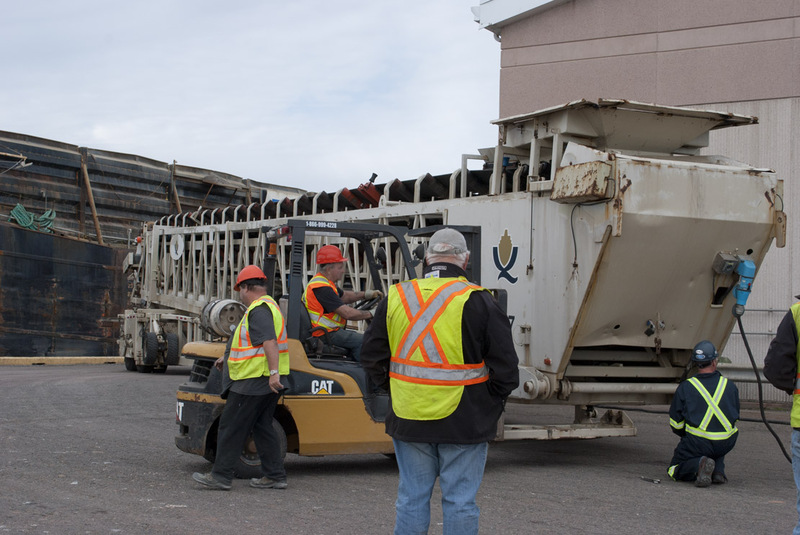 Here at the Summerside Port Corporation, we regularly receive shipments of a diverse array of products for import and export. Check out a few of the ships who have visited our harbour over the past few years. 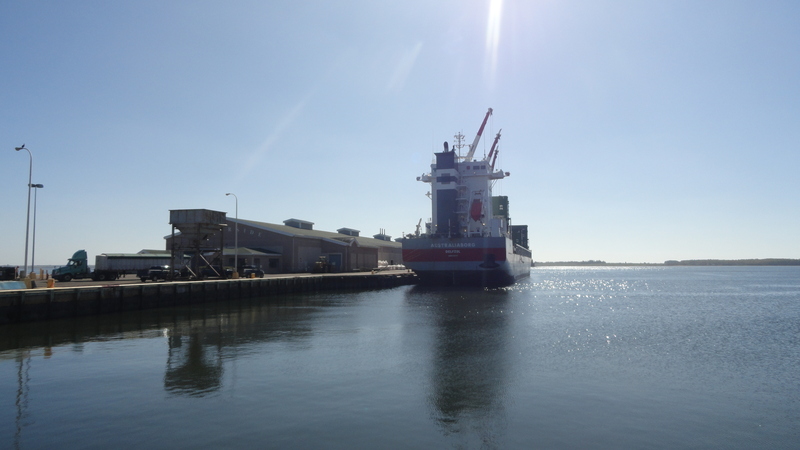 The Australiaborg came into dock in October 2014, and carried fertilizer imports for our local farmers. 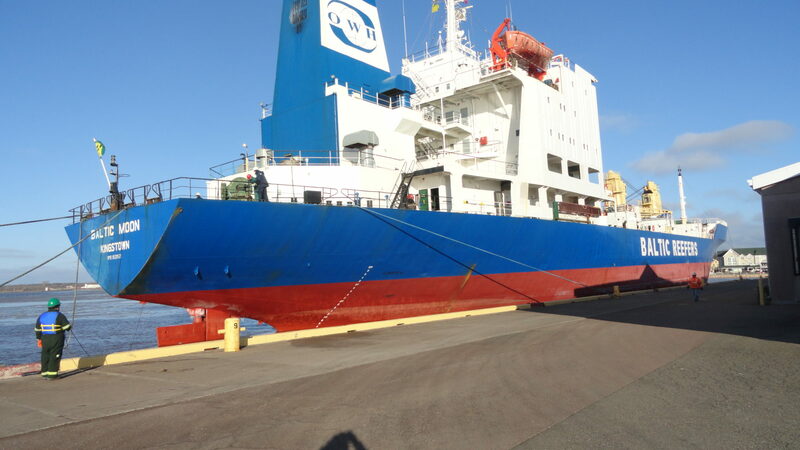 The Baltic Moon docked in December 2014 and carried seed potatoes for export. 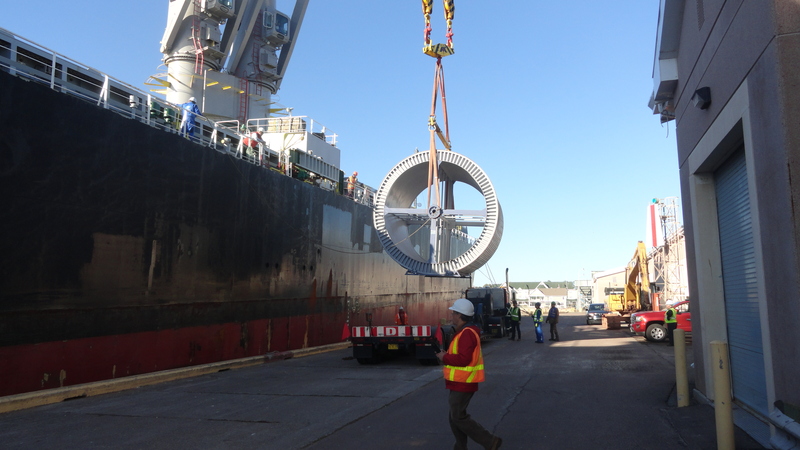 In October 2016, the Thorco Frontier brought a cargo of cables to Summerside. 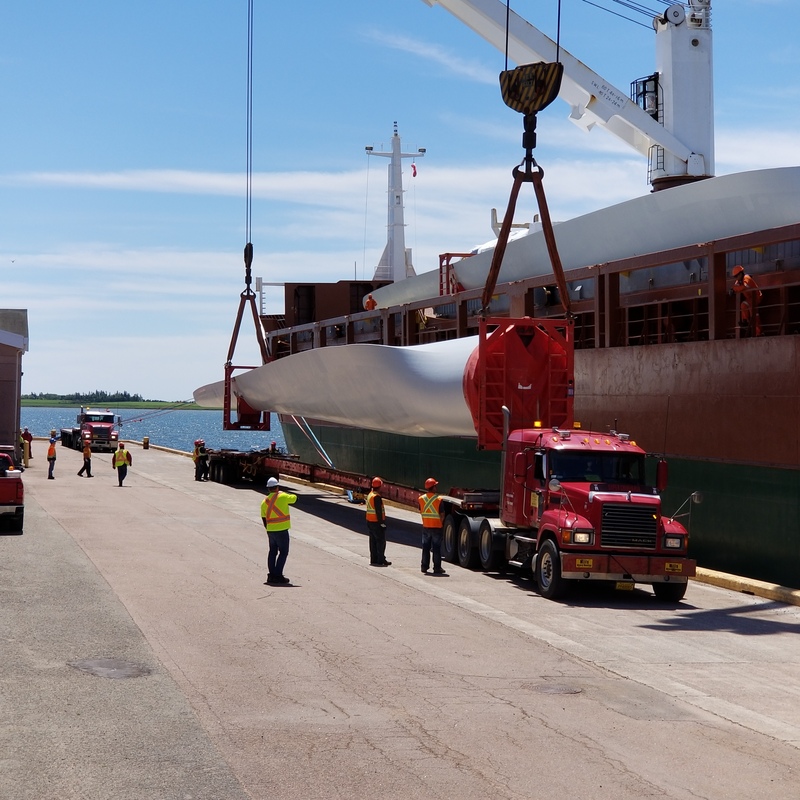 Recently, this past June, the Eemsgracht docked in Summerside with a shipment of windmill blades to support PEI’s burgeoning, sustainable wind energy industry. “We pulled it off,” the pride and relief shows on Neil Campbell’s face. He pulled it off with the partnership of Richardson International and a lot of help from workers and the dock facility in Summerside, PEI, Grain Elevator Staff and Maritime soybean growers. As General Manager of the PEI Grain Elevator Corporation, all of the weight was on his shoulders. What did we pull off? 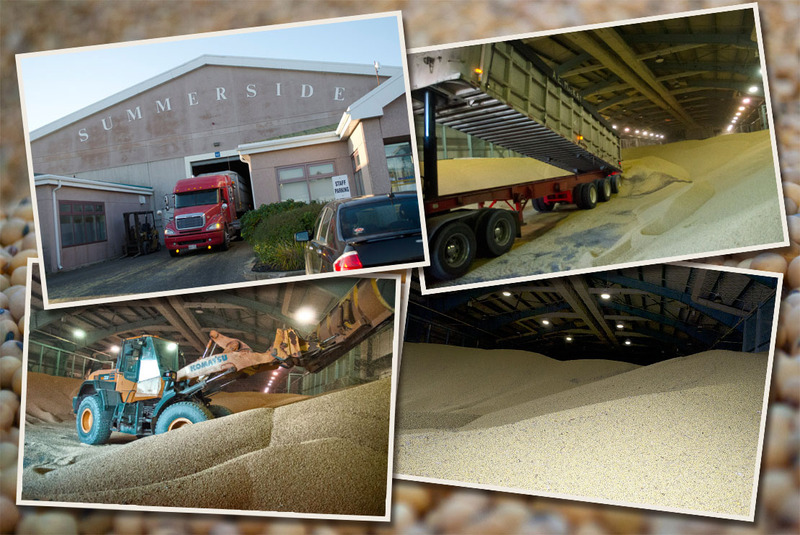 The bulk shipment by water of over 22,000 metric tonnes of soybeans grown in Atlantic Canada. Traditionally these beans would be trucked to Halifax to be stored and then exported in shipping containers carrying approximately 20 tonnes each. This represents over 360 truck loads and 216,000 km of driving. It turned out that the weather was the greatest challenge. Each of the two ships coming into the Port of Summerside had tight time limits for loading. A large warehouse at the port was filled ahead of time to build up inventory. Once the ships arrived this product was the conveyed onto the ship, while at the same time trucks arriving from fields and other facilities were also being loaded directly on the ship. Enter an unusually long period of wind and rain right at loading time – and many more grey hairs all around. Many thanks to Richardson International for being able to adjust their schedule to help make it all work. Both ships travelled from Summerside, PEI to Quebec, where soybeans were transferred to ocean going ships destined for China. These shipments represent close to 50% of the 2016 soybean crop on Prince Edward Island and close to 30% of all the soybeans grown in Atlantic Canada. 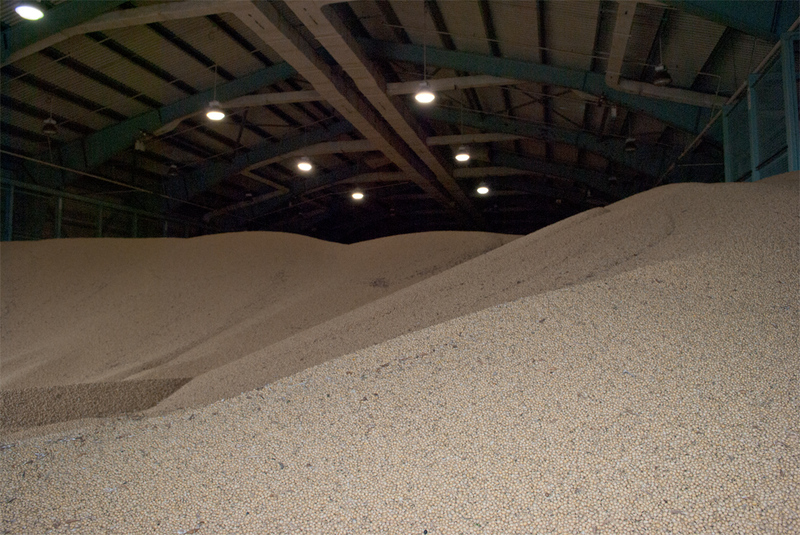 “Being able to ship in large bulk quantities brings us closer to the global customers for soy – this will be important to our industry in the future and will benefit soybean producers in the long term,” reflected Alvin Keenan – Chairman of the PEI Grain Elevator Corporation. Everyone is hopeful that more of this will be in order for the future. Looking back on our agriculture history in Atlantic Canada, the saying that “we are not big enough to be bold and not bold enough to be big” has too often reflected our reality. These shipments and the accomplishment of everyone who worked on this project, proves that this may be a saying of the past. This milestone in our new history, strongly shows that Atlantic Canada’s grain and oilseed sector is coming of age. Summerside Port Corporation Inc. is pleased to announce that Jim Bradley and Ivan Noonan have been appointed as Directors of the Corporation at its annual general meeting held on July 27, 2017, and that Arnold Croken has been appointed Chief Executive Officer (CEO) effective September 18, 2017. Jim is the current CEO/General Manager of Amalgamated Dairies Limited (ADL) and has 35 years of progressive experience in the diary processing and food distribution business. In addition to running his own successful companies, Ivan has significant general management experience in the potato industry. The new Directors will use their extensive business experience and expertise in directing the future of the Corporation. Arnold has extensive experience in the management of regional economic development and in his private business operations. He has been the Corporation’s President and Chair of the Board since the port was transferred from the Federal Government, and prior to that he played a leading role in the negotiations for the port transfer to the Summerside Port Corporation Inc. Arnold will now be overseeing the day to day operations of the Corporation and will be replacing David Bellefontaine who had been working with the Corporation since the facilities were divested to the Summerside Port Corporation Inc. in 2010. The Summerside Port Corporation is comprised of seven members representing the commercial and recreational users of the facility. The Corporation evolved as part of the Port Divestiture Program of Transport Canada in 2010. 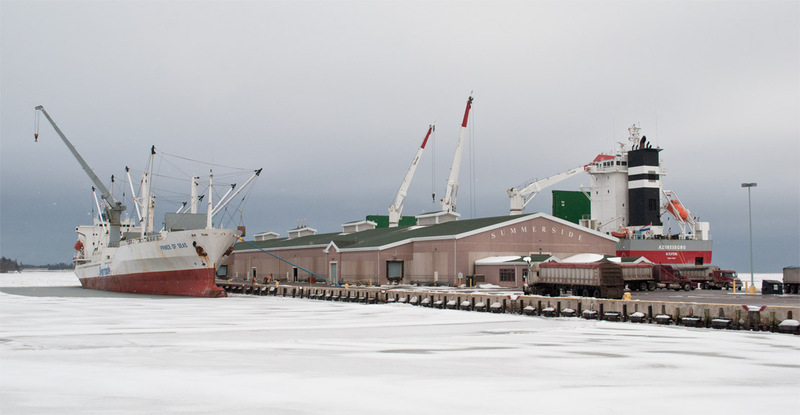 The Summerside Port Corporation Inc. now owns and operates the Port and is a not-for-profit corporation established to manage and control the Port of Summerside and to enhance the economic benefits to the region. The new Officers of the Corporation have also been named; Terry Murphy is the President and Chair of the Board; Jim Bradley is Vice-President and Steve MacFarlane is Secretary-Treasurer. The other Directors are Earle Smith, John MacDonald, Robert Ashley, and Ivan Noonan. The Corporation submits an audited financial certification to the Federal Government on an annual basis to confirm that the funds received by the Corporation from the Federal Government continue to be used for the intended purpose of the port transfer which became effective on February 19, 2010. The Corporation continues to work towards self sustainability prior to the end of its twenty-five-year funding agreement. For the first time in recent memory, Island soy beans are being shipped directly from The Summerside Port Corporation warehouse. In the past, soy beans grown by Island farmers were trucked to Halifax and shipped from there. Approximately 12,000 tonnes of soybeans were loaded onto the cargo ship Evans Spirit to be transported to Sorel, Quebec for distribution. A number of stages are undertaken to ship the soy beans. The first stage is to bring the soy beans from farms to the Port warehouse. 12,000 tonnes makes for a very large hill of beans. The second stage is the setting up of the conveyor system which will load the soy beans into the ship’s holds. The conveyor is a very large piece of equipment which has limited mobility once set up, requiring the ship to be moved for the loading of each of its holds. Once the cargo ship has arrived and is moored in place, the conveyor is aligned with the ship’s hold. 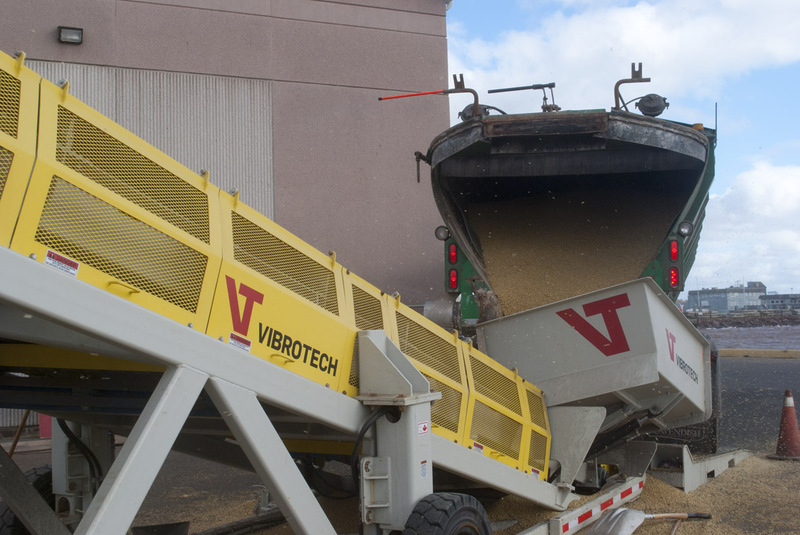 Once everything is in place, trucks bring the soy beans from the warehouse to the conveyor’s hopper at the end of the wharf. The hopper feeds a 2 stage conveyor which lifts the soy beans up and into the ship’s holds. A second shipment of a similar quantity of soy beans is planned for November.